A tiny kitchen doing huge Lebanese hits. Who’s it for? A sucker for a Lebanese sandwich. What should I order? The pulled veal sandwich: soft homemade bread, fried onions and unbeatably tender meat. How much? €2 for homemade lemonade, €10-12 for sandwiches, €3-4 for sides and desserts for €5. 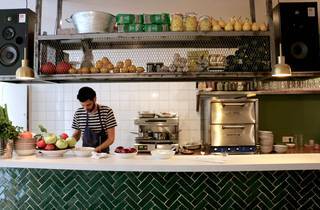 This new Mediterranean spot is led by Pierre Bouko Levy (ex-Miznon) and Cyril Dedieu (ex-Bügelski) who are delivering big flavours to the 10th arrondissement. 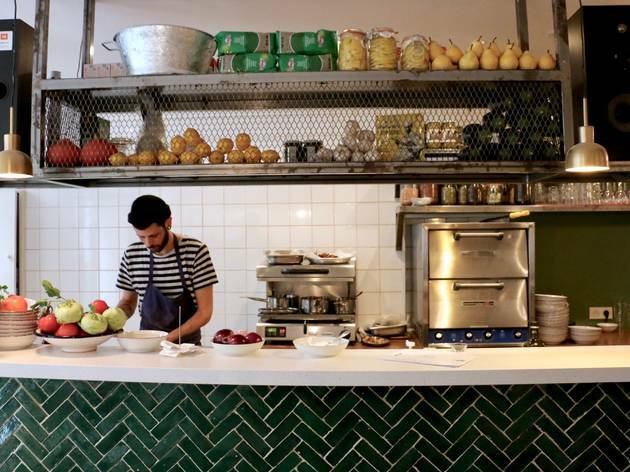 With a backdrop of distressed brick walls, a tiled bar, olive green velvet upholstery and an Israeli groove soundtrack, the menu comes straight from the street food of Jaffa’s suburbs. Choose from kebabs, eye-popping meorav (Jerusalem mixed grill), shawarma mackerel or lamb – served either in a sandwich or with sides. The pulled veal sandwich (€12) included soft, homemade bread, fragrant fried onions and beautifully tender meat. Sides are a must: think golden cauliflower (€4) and tahini and zhug (a creamy sesame dip with spicy garlic sauce). Finish things off with kanafeh, cream cheese in shredded filo pastry, drenched in syrup. The service is always with a smile. Here, the customer isn’t just king, he is the grand emperor.